Trujillo is a city in coastal northwestern Peru and the capital of La Libertad Region. It is located on the banks of the Moche River, near its mouth at the Pacific Ocean, in the Valley of Moche. This was a site of the great prehistoric Moche and Chimu cultures before the Inca conquest expansion. 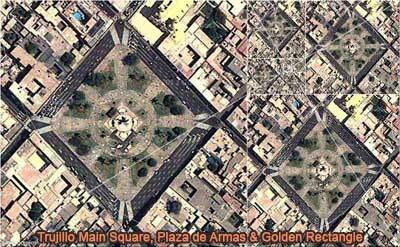 It is the centre of the second most populous metropolitan area of Peru. Trujillo is close to two major archeological sites of pre-Columbian monuments: Chan Chan, the largest adobe city in the ancient world, designated a World Heritage Site by UNESCO in 1986; and the temples of the Sun and Moon (the largest adobe pyramid in Peru). Source: Wikipedia: Trujillo, Peru.